The cover and title of the third novel in Ember in the Ashes has been revealed. I'm so excited for this novel! This is my favourite ongoing series. 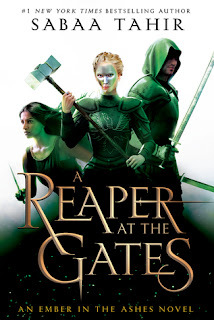 However, I must confess I'm not really that fond of A Reaper at the Gates cover (or maybe I just loved the other covers too much; they were so eerie and mysterious). And, once again, the covers for this series have changed in - publishers really need to stop doing that. I do love this series, but my wallet does not like the idea of buying the first two books again so that they all look perfect together. You can see the new cover art for An Ember in the Ashes and A Torch Against the Night here. A Reaper at the Gates is expected to be released on April 10th 2018. And in the land between the living and the dead, Elias Veturius has given up his freedom to serve as Soul Catcher. But in doing so, he has vowed himself to an ancient power that will stop at nothing to ensure Elias’s devotion—even at the cost of his humanity." It's really heartbreaking how people are attacking each other. </3 But, as you, I'll be buying this book (and most certainly the previous book with the new cover art to have a matching setsbecause it is my fav ongoing series. And, Sabaa is always so kind and lovely.